All zebras are equipped with striped bodies, but they're not exactly the same. The African continent hosts three different types of the equines, which are Burchell's zebras (Equus quagga or burchelli), mountain zebras (Equus zebra) and Grevy's zebra (Equus grevyi). Their life expectancies all differ slightly. Burchell's zebras are also known as "plains zebras." Burchell's zebras hail from the southeastern region of Africa, where they inhabit grassy areas. Not only are they common sights in airy and grassy locales, they also sometimes even live around mountains. Nearby water is a must for them. Mature Burchell's zebras usually weigh anywhere between 385 and 848 pounds, with body lengths of between 85 and 97 inches. The females are usually just a tad smaller than the males -- by roughly 10 percent or so. 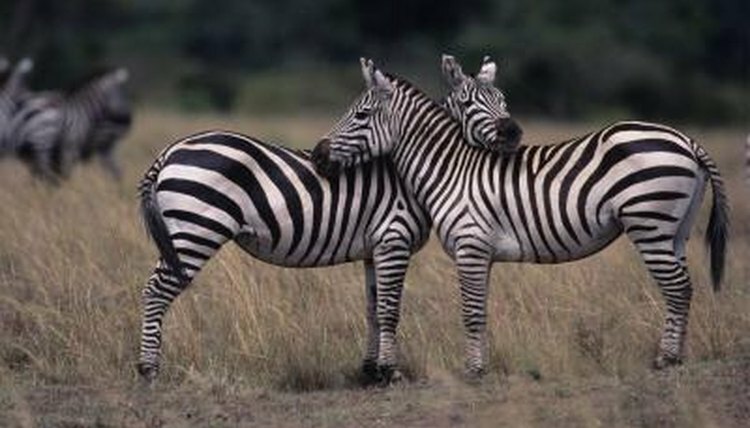 Burchell's zebras are companionable in nature. They often live by themselves, but at the same time, frequently are found in units of between five and twenty individuals. Burchell's zebras that freely roam in nature have approximate lifespans of 20 to 30 years. They usually have longer lifespans when they live in captive environments such as zoos. In those cases, they can often live for up to 40 years. Predation is one of the major causes behind deaths of Burchell's zebras out in nature. Some of the animals that frequently target these zebras are hyenas, lions, crocodiles, leopards, cheetahs and wild dogs. People also sometimes go after these zebras, both for their hides and flesh. Youngsters are particular targets of many predators, and about half of them die because of it. Other factors also sometimes come into play, including malnourishment and insufficient water supplies. Mountain zebras have similar typical wild lifespans as Burchell's zebras. They often survive to be at least 20 years in age in the wild. As far as captive mountain zebras go, the longest-living specimen made it to just 6 months shy of 30 years old. Grevy's zebras out in their native environments frequently survive to around 12 or 13 years in age. Some of them even live for as long as 18 years. Captive specimens generally have longer lives, often in the scope of 22 to 30 years.